Would You Like to Run or Program a Burroughs 205? Looking for more detail? Check the links on the gray bar above. I'll always remember the first time that I encountered the Burroughs 205. I was a freshman at the University of Portland in the fall of 1963. Father Duffy was my Calculus teacher and during a class that autumn, he mentioned that the University was looking for someone to help out in the computer center. Was anyone interested? Uncharacteristically for me in those days, I quickly raised my hand. A couple of days later I approached the computer room door. Two classrooms on the first floor of the Engineering Building had been converted into a computer center earlier that year. General Insurance Company of America, based in Seattle, had donated to the University a surplus B205 system that pretty well filled about eighty percent of the space. A bit of office space took up the balance of the area. As I walked through the door into the actual computer room, I was greeted by the combination of electronic hum and rush of air conditioning that was typical of early mainframe computers. Burroughs recommended an area of about twenty by forty feet for a computer room. This gave plenty of space to spread out the several refrigerator-sized cabinets that made up a computer in the 1960s. The U of P computer room was pretty typical of mainframe installations at the time. The computer stood atop a four-inch thick raised floor. The floor served two purposes. First, it provided room to run the thick cables that interconnected the computer and its peripheral devices such as the IBM 407 accounting machine that served as a printer. Second, it served to allow the movement of cool air from the air-conditioning system into the bottoms of all the cabinets that were filled with heat-producing vacuum tubes. The Datatron was already obsolete. With a 1954 introduction date, this was a nine year old design, and that was the reason that General Insurance was happy to part with it. But the computer still had plenty of life in it for educational and some administrative purposes. For the University of Portland to have its own computer on campus was quite a mark of distinction. We were a Catholic liberal arts university with slightly over two thousand students. Our downtown state college rival, Portland State College, couldn't boast of its own computer for educational purposes although it had a great programming instructor, Dr. Robert Broussard, who utilized another Datatron. Miles to the south, the distinguished engineering school of Oregon State University could only point to its ALWAC III-e, a machine of comparable age, power and design. The Datatron has a fascinating background as it evolved from a "skunk works" project in the back room of an electronics instrument company in southern California to become the backbone of the Burroughs Corporation's tardy move into computers. The major output of the Mass Spectrometer was data and lots of it. To produce the needed analysis, one had to solve a set of simultaneous linear equations. This required a lot of manual work with the calculators of the day. Cliff Berry and Sibyl Rock developed and patented an analog computer that produced excellent results solving a series of 12 simultaneous equations in 12 unknowns. 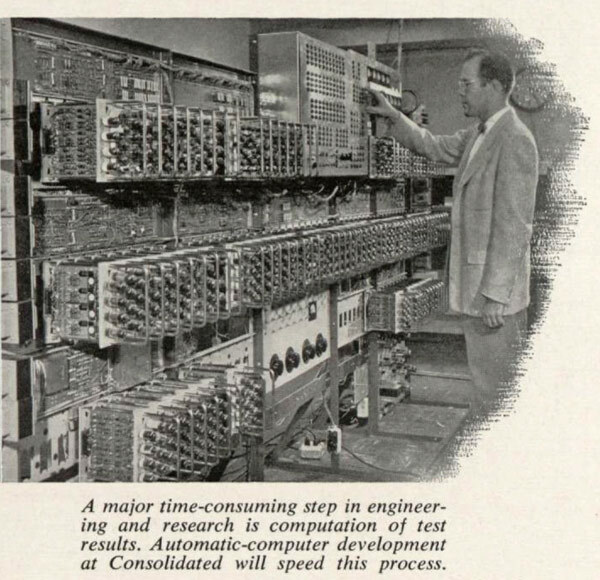 This was now 1946 and this analog computer further cemented CEC's position in the Spectrometer business. As more years passed, Berry realized the potential for the digital computer to further enhance CEC's edge in his part of the business. He pressed CEC to develop their own digital computer. In 1951, CEC engaged Harry Huskey, then working on the National Bureau of Standards SWAC computer at nearby UCLA as a lecturer on digital technology to the project team. Progress was relatively slow at first. CEC needed someone who could bridge the gap between Huskey and the design team. Another mathematician, this one an expert in number theory, the Norwegian Ernst Selmer, was lecturing at Cal Tech. Selmer had come to the United States to learn about electronic computing technology on an eighteen-month visit. He arrived in January of 1951 bound for Princeton where the IAS computer was being constructed for John Von Neumann. Selmer relates an amusing anecdote in this video as he describes his initial visit to the Institute. From Princeton, Selmer traveled to Berkeley where he contributed to the CALDIC computer being constructed by Paul Morton. He was hired by CEC management as a consultant late in 1951 and ultimately designed most of the logic for the Datatron. By May of 1952, Chief Engineer, L. P. Robinson, was able to describe the Datatron (then known as the CEC 30-201) as part of a Navy symposium at the Pentagon on "Commercially Available General-Purpose Electronic Digital Computers of Moderate Price." To describe the Datatron as "commercially available" at this point was a bit of a stretch. It would be a full year until the first "breadboard" version of the machine was complete and over two years until the first production unit shipped. While the technical team went about engineering the computer, CEC management had other worries. They understood that the computer business was far different from the instrument business that they were in. In 1952, they designated the development group as a separate Computer Division and during the summer of that year the team of about thirty people moved into a vacant market building at 717 North Lake Avenue in Pasadena. Realizing that the continued development of the CEC computer was going to take a great deal of money, CEC management decided to spin off the Computer Division as a separate corporation but retained a thirty-six percent ownership in the new company, ElectroData Corporation. ElectroData went public on the American Stock Exchange at $3.50 a share in April of 1954. It would rise as high as $21 in spite of a lack of profits. 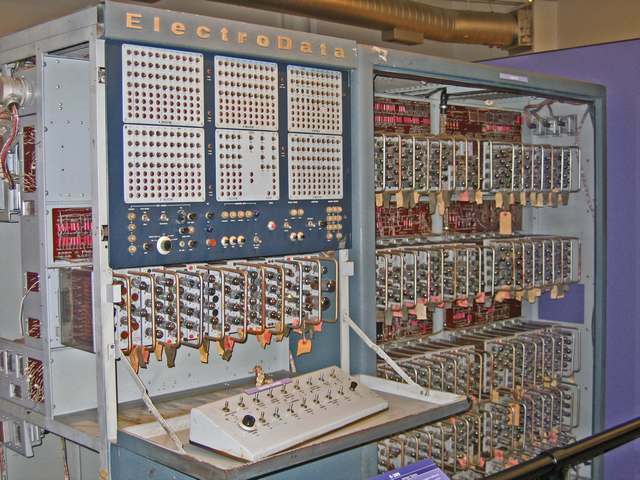 Formal announcement of the ElectroData 203 computer took place in February of 1954. In April of 1954, the New York Times noted the introduction of a new "electronic brain" by ElectroData at the bargain rate of about $125,000. During 1954 ElectroData was running ads in Fortune promoting their Electronic Data-Processing Equipment for Science, Industry and Commerce. In June of 1954, the first production model shipped to the nearby Jet Propulsion Laboratory at Cal Tech. A total of seven systems were shipped in 1954 followed by thirteen more in 1955. The production line was humming. Since competitive pressures required that computer be available via lease, costs continued to mount, however, and revenue was comparatively slim. The new corporation had outgrown their first home and moved to a larger facility at 460 Sierra Madre Villa, still in Pasadena. In early 1956, Phillip Fogg, Chairman of CEC set up a board meeting to consider the future of his ElectroData computer operation. ElectroData had now become the third largest manufacturer of computers in the world! Fogg and the board realized that while they had an excellent product, continued development, sales expense and rapid growth were going to require about $60 million over the next five years. This was twice the net worth of CEC. CEC/ElectroData was on the verge of throwing in the towel. As fate would have it, that very day a phone call came in from John Coleman, the president of Burroughs Corporation. Now, Burroughs was a significant manufacturer of office computation equipment. That meant primarily mechanical adding machines and banking equipment at the time. Anyone who ever had to move one of these beasts from one table to another knows that if they were priced by the pound, Burroughs was probably doing all right financially. Realizing that office calculation was going electronic, their first venture into the marketplace was a timid one with a specialized machine lacking a stored program architecture, the E101, rather than a General Purpose computer. They found their customers saying, "No thanks, we are going with a full General Purpose computer." As Burroughs management looked around for a way to jump start their entry into the computer field, they spotted ElectroData. On July 1, 1956 Burroughs purchased ElectroData Corporation from CEC in a stock swap with one share of Burroughs at $34 a share for each two shares of ElectroData. Regardless of whether you see reference to the Datatron as a CEC 30-201, CEC 30-203, an ElectroData 204 or 205, or a Burroughs 205, it is all the same machine. The numbers primarily signify the development and addition of new peripherals. The CEC 30-201 described at the Pentagon had only paper tape input and Flexowriter output. That machine had the same architecture, clock cycle and performance as the later Burroughs 205. While the 201 only had 34 instructions, most of what was added later were instructions to handle the Tape, Cardatron and Floating Point units. What Made the Datatron Special? 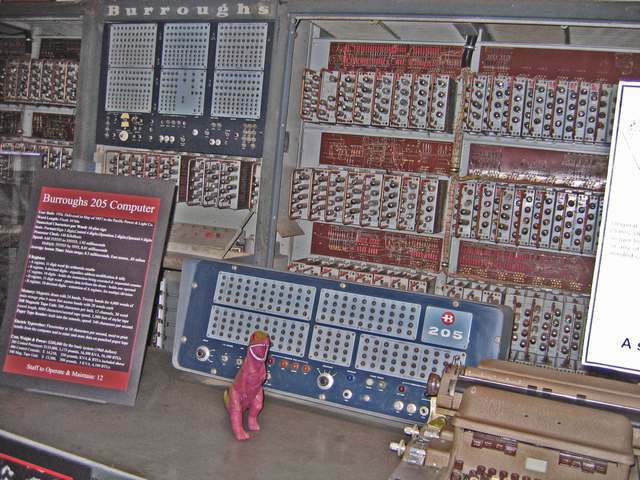 It seems that almost everyone who encountered the Burroughs 205 and continued their involvement with computers developed a real affection for the machine. There are reasons for this, of course. B-Register The Datatron is generally recognized as the first computer to be marketed with an index register. There are references on the Internet to this register being named for Burroughs. Since the register was named about five years before Burroughs acquired ElectroData, in fact, even before ElectroData was spun off from Consolidated Engineering, we can pretty well dismiss that theory. In fact the B-Register's origins lie in England. The University of Manchester had developed the index register concept for the Mark I (also known as MADM) in 1949 and named it the B-Box to distinguish it from the accumulator, or A-Box. Mathematician, Harry Huskey, was aware of the B-box because he had contacts at Manchester built up during a one-year appointment in England during 1947 where he worked under Alan Turing at Teddington on the ACE computer. He introduced the index register concept to the Datatron design team where Ernst Selmer immediately grasped the importance. The B-register served two purposes. The first was to provide address modification and looping countdown. A more interesting purpose was that the B-register could be utilized during program loading and that allowed subroutines to be written with relative addressing. This provided for easy relocation of subroutines, a godsend to scientific and engineering calculation programs. High Speed Drum Access Technique. There were three techniques that computer manufacturers used to deal with the fairly slow performance of a magnetic drum as main storage. One was to simply spin the drum faster. This puts limits on the size of drum and total memory capacity suffers. A second technique was to use a system in which each instruction specifies the address of the subsequent instruction allowing optimum performance but making the programming quite difficult. The Datatron used a third technique which placed a read head one-tenth of a revolution apart from a write head and thus created a sort of magnetic delay-line with access ten times as fast as the main memory on the drum. This introduced some programming complexity but not nearly as much as the previously described method. Ease of Programming. Customers noted three features that made the Datatron easy to program. First was its use of the binary-coded-decimal number system. Programmers and operators were looking at ten-digit decimal numbers, where each digit was represented by a four bits having the values of 1,2 4 and 8. Second was the presence of a breakpoint switch on the console. Setting this switch allowed pre-coded stopping points in the program to become active, halting the machine for a readout of the registers. "Step Mode" allowed execution of the program instructions, one at a time while observing the results. The combination of step mode following a breakpoint, allowed a programmer to follow the program flow in a style not frequently seen until the introduction of the personal computer. Floating Point Arithmetic. The Datatron was optionally equipped with hardware for floating point arithmetic. Implemented by John Alrich, this was a refrigerator-sized cabinet that was attached to the left end of the otherwise symmetric cabinet that made up the Datatron CPU. With this option in place, the Datatron could handle ten-digit numeric computations or floating-point numbers with an eight digit mantissa and two digit exponent. With full multiply and divide capabilities the Datatron now could handle numbers ranging from 10-49 to 1050 When Alrich first encountered his new marketing Vice President, Ed McCollister, McCollister told him that the new cabinet was not worth its weight in gold, it is worth its weight in diamonds. This box would give ElectroData and later Burroughs access to the scientific engineering market as well as the commercial market they were initially targeting. Datafile subsystem. One of the more remarkable peripherals ever developed for any computer. It was the brainchild of Duncan MacDonald who would later go on to become Director of Engineering and then General Manager at Pasadena. This was a random access device. Remember, the disk drive had not yet been invented and drum memory was frightfully expensive. Tape access was relatively slow. It would take about eight minutes to move to the end of a reel of tape. What the Datafile did, in effect, was to take five reels of magnetic tape and split it up into fifty small chunks. These were suspended parallel to one another in a large bin (Some called it a coffin) and could be addressed individually. Any of the one hundred thousand blocks could be accessed in an average of sixteen seconds. You could think of it as a disk drive with one hundred tracks but revolving very slowly at about two revolutions per minute. Put ten of these Datafile systems together and you would have random access to any of one million blocks of data. This was the key to to the door for Burroughs entry into several insurance companies who bought Datatrons. When introduced in December of 1956, Burroughs claimed a backlog or orders totaling $2 million for the $75,000 device. Courtesy of the Charles Babbage Institute, University of Minnesota, Minneapolis. Cardatron subsystem. The input and output of data on the Datatron was handled by conventional IBM punched card accounting machines. In most cases an IBM 089 Collator served as card reader and an IBM 407 Accounting Machine served as the printer. 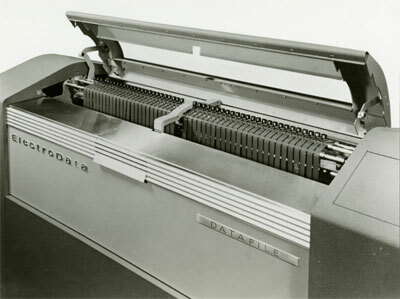 The Cardatron Subsystem on the Datatron allowed a programmer to pre-program and load a "format band" for the printer that handled spacing, zero suppression etc. The programmer could subsequently send a string of perhaps thirty characters to the Cardatron system that would be spaced appropriately across the printed line. While the Cardatron and printer were handling this line, the Datatron was calculating and preparing the next line. 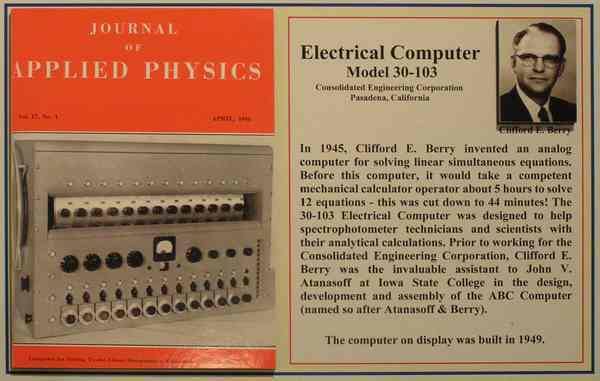 Cliff Berry of the ABC, Atanasoff-Berry-Computer, the predecessor to all electronic computers. Berry was a senior scientist with Consolidated Engineering specializing in the design of Mass Spectrometers, Consolidated's principal product line. He was the driving force behind Consolidated's venture into computers. He and a colleague had earlier patented an analog computer for use in handling the large amounts of data coming from his Mass Spectrometers. Although he was not officially on the design team, he sat in on the lectures by Selmer and Huskey that introduced Consolidated's designers to the digital computer. Ernst Selmer, a Norwegian mathematician specializing in number theory and cryptography. Selmer had spent time at Princeton working with Von Neumann's group on the IAS computer in 1951. The IAS was the fastest computer in the world when it was fully operational in 1952. Selmer had later moved out to California and in early 1952 and was a visiting lecturer in the mathematics department at Cal Tech. He also had consulted at Berkeley where he designed the add-subtract control for the CALDIC. He was recommended to CEC management by Von Neumann and ended up designing much of the Datatron arithmetic unit. While Selmer is a very key player in the Datatron development, he is difficult to research outside of his Datatron role since his cryptographic work was so secret that he was not allowed to even report his consulting income to the Norwegian tax authorities. Harry Huskey, an American mathematician who had worked on the ENIAC and EDVAC projects at the University of Pennsylvania, worked at Teddington England with Alan Turing in 1947 on the prototype Pilot ACE computer. He later moved to California and designed the SWAC computer for the National Bureau of Standards on the UCLA campus. 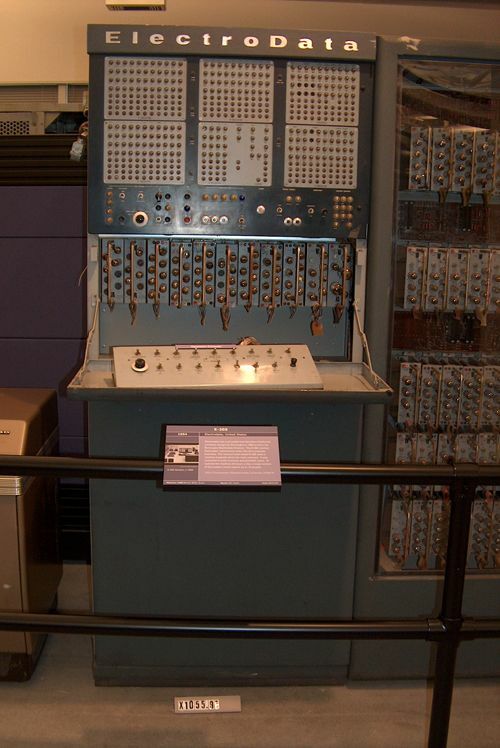 Completed in July 1950, the SWAC was the fastest computer in the world until Von Neumann's IAS computer was completed. Huskey's contributions to the Datatron were of a general educational nature for the design team. Ida Rhodes, one of the pioneers of the computer industry. Better known for her role with the SEAC at the National Bureau of Standards and work with the Univac at the Census Bureau, Rhodes was another consultant hired by CEC during late 1952. She suggested the Breakpoint technique that was ultimately incorporated into the Datatron. Gerturd Blanch, Ida Rhodes' mentor was also directly employed by CEC for a few months in late 1953. It Did the Right Stuff - Perhaps Being A Bit of a Publicity Hog too. On Friday night, December 30 of 1955, the Datatron forecast the results for the five major bowl games. It correctly forecast the winners of the Rose, Orange, Sugar and Cotton bowls and the results were announced on the 6:15 newscast of KCOP-TV, channel 13. The only miss was on the Alligator bowl where the Datatron had forecast a tie. This is most likely the first widely disseminated "computer prediction" for a sports event. In 1957 it was the star of the show, playing blackjack as CalTech showed off their Electronic Brains." In 1957 it translated the headlines in Pravda from Russian to English. In 1961 during the first launch of a Saturn rocket, the Datatron 205 analyzed real-time guidance data from a tar-paper shack at Cape Canaveral. Don Knuth Yes, the author of The Art of Computer Programming wrote the Algol 58 Compiler for the Datatron for $5,500 as a summer project during 1960 while still a student at Case Institute. For a highly entertaining account of this summer project, follow this link into the amazing historical documentation of Ed Thelen. Alan Perlis The first head of the Computer Science department at Purdue who badgered ElectroData into including the Floating Point unit as a Datatron option. Perlis had also suggested glass doors for the front of the cabinets. That suggestion was not implemented. J B Rosen The originator of Rosen's Method for non-linear programming utilized the machine while he was at Shell Oil. Tom Lazear, founder and CEO of VersaCAD, took the first tentative steps into the world of Computer Aided Design while working on a Datatron at Fluor in 1959. Lazear worked with Fluor engineer Eli Czerniak to create programs that would aid in the design of pressure vessels. 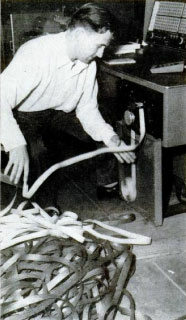 Peter Toma, Hungarian-born computer scientist and linguist who would later develop the SYSTRAN machine translation system got his start on the Datatron at Cal Tech in 1956. 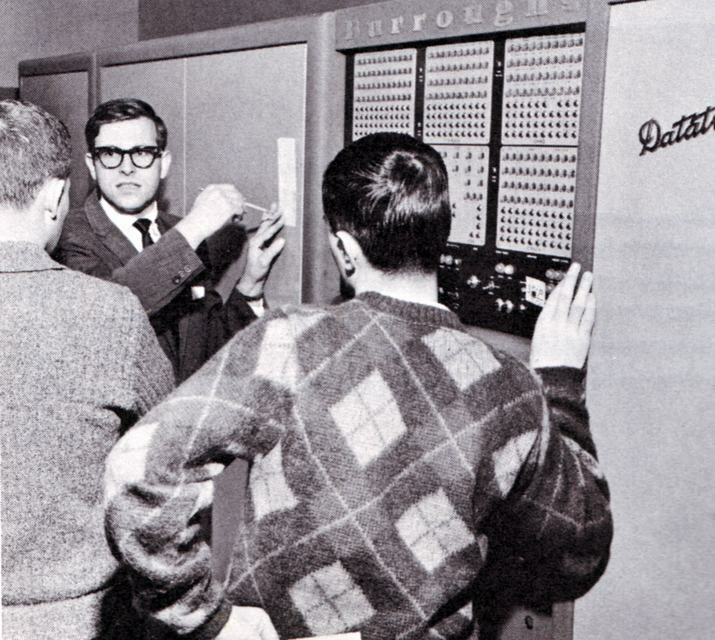 The translation efforts on the Datatron were memorialized in this photo which appeared in the January, 1958, issue of Popular Mechanics. Datatron Say it out loud! Even the later Burroughs models had this name emblazoned on the CPU cabinet. And the name has an interesting origin. In 1954, planners at IBM had begun looking at a new machine that would unify their commercial and scientific machine architectures. The proposed new system was defined in a series of thirty-eight memos and with a project name of Datatron. 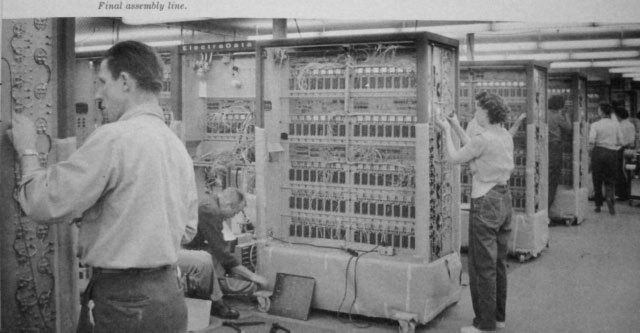 Shortly after this system was shelved, ElectroData hired IBMer, Ed McCollister, in early 1955 to head the marketing division for their new computer. He brought the name with him. The American Computer Museum in Bozeman, Montana has a full system. This one is the Pacific Power and Light system from Portland, Oregon that our second U of P system provided backup for. The Computer History Museum in San Jose, California has a Datatron. The University of Virginia's Computer Museum in Charlottesville, Virginia holds a fairly good set of Datatron manuals. Portions are available online. The Southwest Museum of Engineering, Communications and Computation History in Glendale, Arizona has a Jack Aldridge exhibit that includes a nice Flexowriter manual and ElectroData employment application forms. The Charles Babbage Institute at the University of Minnesota holds 681 boxes of records from the Burroughs Corporation. These include numerous boxes from ElectroData Corporation including notes from several of the original project managers and participants. On September 15, 1965, I settled down at home in front of our Hallicrafters black and white television set to watch the premier episode of Lost in Space. The tension is building as we are introduced to the Robinson family and we fear for their lives as we discover the diabolical intentions of Dr. Smith. As the camera pans around the spacecraft, three Burroughs 205 consoles come into view controlling the Jupiter 2. Can you say, "Rolling on the Floor, Laughing Out Loud?" Barely a year later, Batman has installed his own 205 in the Batcave! Stan Brewer has inventoried a great collection of TV and movie appearances by the Datatron here. Another collection of Datatron movie and TV appearances are found at this site belonging to James Carter. What Made a Datatron Installation Successful? Success or failure of an individual Datatron site depended largely on the capability of the maintenance staff. Known as "Field Engineers" based on CEC's earlier designation, these intrepid folks had to master and in some cases invent techniques for minimizing the frequency and duration of machine outages. On a separate page I have described some of these techniques as practiced by one of the best. Do you have comments or experience with the Burroughs 205 that you would like to share? I have set up a blog where you can share your own stories about the Datatron. Or, send me an e-mail.